Heart disease is the #1 killer of women — just like men. So why don’t we ever talk about it? Internationally recognized expert on heart disease, Dr. Martha Gulati, brings us a four-part video series to raise awareness about heart disease and the particular risks that women face. 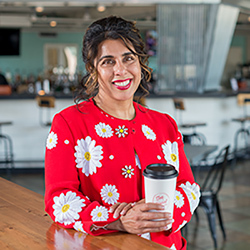 Dr. Martha Gulati and the University of Arizona College of Medicine – Phoenix created the Heart to Heart campaign to educate everyone — especially women — about the risks of heart attacks and stroke. Dr. Gulati makes this important dialogue fun, engaging and informative — all over a cup of coffee. Martha Gulati, MD, MS, FACC, FAHA (Full Bio), is Division Chief of Cardiology for the UA College of Medicine – Phoenix, Physician Executive Director for Banner – University Medicine Heart Institute and Editor-in-Chief of the American College of Cardiology “CardioSmart” initiative. Banner – University Medical Center Phoenix. The National Coalition for Women with Heart Disease. CardioSmart, American College of Cardiology. On April 3, the UA College of Medicine – Phoenix hosted the annual Red Dress Cocktail Party to raise awareness about heart disease.